More than most demi-gods, Ornn values his privacy. Dwelling in solitude beneath an ancient volcano, he stokes bubbling cauldrons of molten stone to forge items of unsurpassed quality. Yet from these depths, Ornn senses trouble; divine beings are once again meddling in mortal affairs. During the upcoming wars, the Freljord—and the world—will need a good blacksmith. 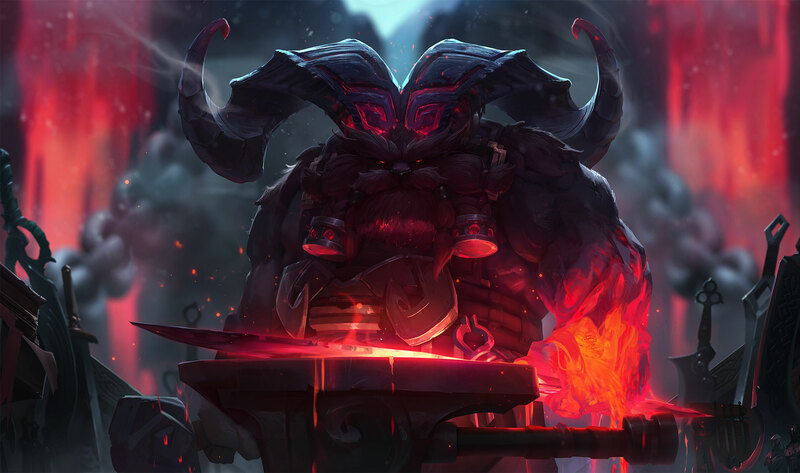 Living Forge: Ornn can spend gold to forge items for himself any time he's out of combat. For convenience, suggested items appear in a special on-screen menu. Ornn can also open the shop manually to build any item. 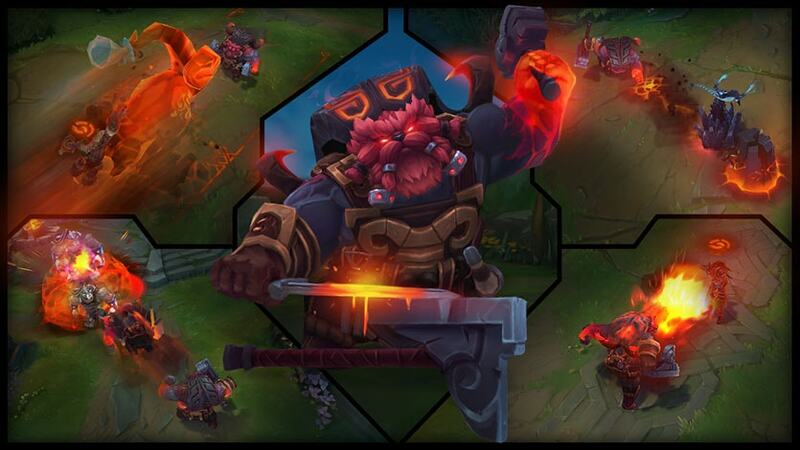 Master Craftsman: Ornn and his teammates have access to special upgrades for select items in the shop. Each player is limited to one of these upgrades. Ornn slams the ground, sending out a fissure that deals physical damage and slows enemies. After a small delay, a magma pillar forms at the target location, functioning like a tiny wall for a few seconds. Ornn becomes unstoppable, shields himself, and belches out flames. These flames deal a portion of the enemy's current health as magic damage. Enemies struck by the final gout of flame become Brittle. Ornn's basic attacks knock back Brittle targets. When Brittle, enemies suffer a portion of their maximum health as bonus damage when struck by immobilizing effects. Immobilizing effects also last longer when used on Brittle enemies. Ornn charges, dealing damage to enemies he passes through. If Ornn collides with terrain while charging, the impact creates a shockwave that deals damage and knocks up enemies. This ability destroys player-created terrain. Ornn summons a massive fire elemental at a target location. It then travels toward him with increasing speed. Enemies run over by the elemental take magic damage and become Brittle. Ornn can recast this ability to charge forward. If he strikes the elemental with the charge, he'll redirect it. The redirected elemental will then knock up all struck enemies, dealing the same damage as before and applying the Brittle effect. Ornn prefers to do things himself. He dislikes bartering with the Rift’s merchants, so he forges his own gear. If he can't pin his enemies to terrain with a Searing Charge, he brings the terrain to them with Volcanic Rupture. Ornn is a leader on the battlefield. He initiates fights on his terms with Call of the Forge God, then charges in, bellowing and tearing apart his foes with titanic force. Ornn’s lane-staying power is second-to-none thanks to his ability to forge new items without returning to base. You’ll want to study up on early-game itemization options so you can quickly craft the right gear to counter your lane opponent. Since each of Ornn’s allies can build one of his unique item upgrades, Ornn’s teammates effectively have a higher gold cap than their opponents. Someone should tell Nasus there’s a new late-game god in town. Other champs who create terrain (Trundle, Azir) synergize extremely well with Ornn, since he can Searing Charge into champ-made structures to knock up enemies. Likewise, allies like Poppy and Vayne can pin opponents to Volcanic Rupture’s pillar.